The all-new 2007 Winnebago Access is an entry-level Class C motorhome that offers great value in a convenient user-friendly design. Offering six floorplans that range in length from 23 to 31 feet, there’s a variety of models for different needs. 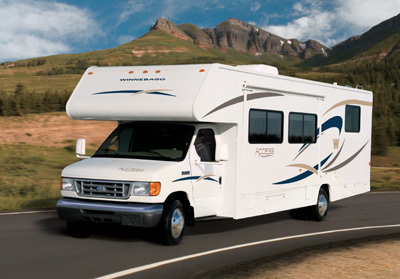 The same motorhome is offered by Itasca dealers as the Impulse. Floorplans are the same, although decor options are different between the Access and Impulse. 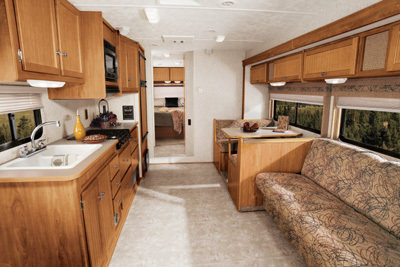 Built on either a Ford or Workhorse chassis, each floorplan offers a fully equipped galley, including a microwave, three-burner range top, double-door refrigerator/freezer and a double sink; bathroom and sleeping accommodations, including an area above the cab for a bed or an optional entertainment center if you prefer. Floorplan highlights of the 2007 Winnebago Access or Itasca Impulse include the 22B that features a large, rear bath that runs the width of the coach, an in-line galley and sofa opposite of the dinette. The 24V offers a rear corner bed, large wardrobe next to the bathroom and swivel/slide lounge chair for relaxing. The 26A features roominess with a front 20-inch dinette slideout, large angled galley, rear corner bed and a spacious rear trunk with a recessed storage system that can hold anything from ice and beverages to wet swimsuits after a day on the lake. You’ll love the 28P with a unique bedroom design, while the 28P and 29T both offer an available U-shaped dinette and optional slideout room. The 29T also offers a handy L-shaped galley and queen bed. Lastly, the 31C features spaciousness with a front sofa/dinette slideout room, and a shirt closet with a convenient countertop above for folding clothes. The new Winnebago Access and Itasca Impulse also feature a 13,500-BTU air conditioner for those hot days and a 25,000-BTU furnace on the 22B and 24V and a 30,000-BTU furnace on the 26A, 28P, 29T and 31C when it’s cool outside. The Winnebago Access is offered in 6 models, ranging in price from $58,415 to $68,074. Click on the following model names for full specifications and floorplan images. Photos: Courtesy of Winnebago Industries, Inc. Unauthorized use not permitted. Winnebago Access pictured above.